NAMM, the trade group that includes music manufacturers and vendors, holds its flagship conference every January in Anaheim, California. It’s the biggest music trade show in the world, and even the biggest trade show of the year in Anaheim, home to Disneyland. But, of course, we’re about more than just pre-packaged industry news. So, we’ll do things a little differently this year. As always, we won’t cover every last bit of news, just the stuff we really find important. And in a twist, we’re also looking to volunteer participants to help us cover the community around music technology, not just the big industry-driven stuff. At 10:00 or 11:00 am tomorrow, January 14, Pacific Time (GMT-8), embargoes begin lifting on most NAMM news. On CDM, we’ll have our own editorial look at the show. For the latest, round-the-clock news, videos, and clips, dispatches from our contributors, as well as unedited press clippings, watch namm.createdigitalmusic.com. We’ll take the best bits of the noisepages site and round them up on CDM. We’ll be covering official and unofficial news this week. So, yes, we expect to cover big names like Roland. We’ll also be picking up on tech in hotel rooms, open-source oddities at the party Friday, and hardware that can’t afford NAMM booths – you know, just like we always do. Every day is a news day around here. Friday night in Los Angeles, I’ll be part of the big, unofficial Wham Bam Thank You NAMM party. We’ll have video, sound, and feature coverage both of the artists and of the discussion we hope to kick off about the future of music tech. So watch for bits of that over the coming days. 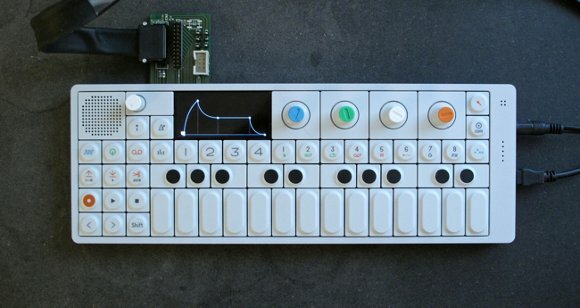 The OP-1 is way, way on the top of my hardware list for the year. Ableton and Serato have already teased ableton-serato.com. So, obviously, if you were to tune into CDM at 11am California time tomorrow, I’m sure there won’t be any news whatsoever. Got that? Do not, by any means, expect any news Thursday around 11am. I’ve been looking forward to talking to Teenage Engineering about their gorgeous-looking, Casio-inspired, FM radio and FM synthesis-equipped OP-1 synthesizer for months now; NAMM had always been the timeframe. Whatever isn’t ready, I should be able to catch when I’m in Stockholm in February. I’m imagining their studio looks something like the Wonka Chocolate Factory. If you’re there, you can find them on the floor. I expect lots more controller hardware from lots more makers, and, whether it’s at NAMM or Messe or (for many manufacturers) completely independent of any trade show, I think 2010 will see more integrated hardware-software products. No LinnDrum. There won’t be a LinnDrum announcement this year. That’s actually not a rumor. I think it’s best to diffuse any potential disappointment early. Dave Smith Instruments, though, have promised an announcement, so we’ll see what Dave’s been up to and I hope to catch up with Roger (Linn) later this year. I could make more predictions, except I already know a lot about what’s coming out, so the predicting is somewhat less fun. Let’s see, let’s see, something I don’t know — I predict that the panelists I assembled on Friday will propose something so ludicrous and absurd for futuristic music tech that we’ll all be forced to make it. And protests of major guitar manufacturers. On a more sobering note, the Korean workers who make major US brands like Fender, Ibanez, and Gibson are assembling a protest of the whole show, as reported by MusicRadar. Rage Against the Machine’s Tom Morello is even involved. It’s guitars, which strictly speaking isn’t NAMM news – but nearly everything we make (even the inner circuits of a US-assembled monome) is built with Asian labor. If anyone can get the scoop on this protest, I’m happy to hear it. Big makers skipping trade shows: Native Instruments, for instance, is skipping pricey trade shows to talk directly to would-be customers on the Web. So if there’s an announcement from NI – among ranks of manufacturers I expect will gradually grow – it’ll be elsewhere. I hear this Web thing is going to be huge. Ruin & Wesen’s magic box: The techno geniuses of Ruin & Wesen have been hard at work on their MiniCommand, plus the open Miduino library – built on Arduino – that powers it. This deserves a lot more attention for things like algorithmic musical programming, but the short version: expect magical music-programming capabilities that bridge hardware and software. OpenSoundControl/OSC: Yeah, I know: OSC has been waiting for its big breakout year for some time. But don’t forget, OSC already has new traction, from becoming a standard in live visual/VJ apps almost overnight to inclusion on new hardware. There’s some big news as far as better hardware and software implementation in the pipeline. Oh, and because it’s open, we’ll get to just talk about this, and actually make it happen. OSC won’t be at NAMM because that’s not where it belongs: it’s a way of implementing Internet standards as much as it is a way of creating music-specific protocols, and a lot of its future lies directly in your hands. Open hardware: It won’t be on the NAMM floor, but there is a convergence of monome users, alternative developers, and even (at the party Friday night) open-hardware Arduinomes. DIY tech is something we’ll be watching in Anaheim and all year long.